The Carolina Hurricanes have ended their nine-season playoff drought by clinching a spot in the postseason in their 81st game of the schedule. It’s obviously better late than never for the franchise as they downed the New Jersey Devils 3-1 at home on April 4th to seal a position. The win gave the Hurricanes a three-point lead over the Montreal Canadiens in the standings with just one game remaining for each team. However, Carolina still won’t know where they’ll finish since the Columbus Blue Jackets could possibly overtake them for the first wild card playoff spot by the time the regular season concludes on April 6th. Columbus trails Carolina by two points and have a pair of games remaining. The Hurricanes also trail the Pittsburgh Penguins by two points and could conceivably catch them for third place in the Metropolitan Division. Goaltender Petr Mrazek stopped 35 shots against the Devils in the win and it gave the Hurricanes a 45-29-7 record on the season. With Montreal falling 2-1 to the Capitals in Washington, the Carolina win sparked celebrations in the city of Raleigh. The 27-year-old Mrazek of the Czech Republic has been one of the key performers for the Hurricanes this season. He’s gone 11-2 over his last 13 starts and over the last six he’s 5-1 with a 1.65 goals-against average and a stunning 94.5 save percentage. He’s 23-14-3 on the season with four shutouts and a 2.39 GAA with a 91.4 save percentage. Mrazek was signed as a free agent last July after spending several years with the Detroit Red Wings and the last few months of 2017/18 with the Philadelphia Flyers. Mrazek was drafted in the fifth round with the 141st overall pick in 2010by Detroit while playing with Ottawa of the Ontario Hockey League. He was named to the Second All-Rookie Team and the the Third All-Star Team in the OHL and also took home the Dinty Moore Trophy for the best GAA as a rookie. Mrazek went 75-37-10 in the OHL with a 2.87 GAA, a 91.6 save percentage and 10 shutouts in 132 appearances. After being drafted, Mrazek got some pro experience with Toledo of the East Coast Hockey League and Grand Rapids in the American League while being named to the AHL’s Second All-Star Team in 2013/14. It was the 2014/15 season when Mrazek cracked the Red Wings lineup as a regular and he spent just over three and a half season with the club before being traded to the Flyers for a pair of draft picks in February of 2018. Mrazek then decided to sign with a one-year deal with Carolina for $1.5 million when becoming an unrestricted free agent last summer. He’s been a pleasant surprise for the team and its fans and has firmly established himself as an NHL-calibre starting goalie with his play this season. He has had some help though as 35-year-old Curtis McElhinney has also been solid since the Hurricanes picked him up on waivers from the Toronto Maple Leafs earlier this season. The veteran has gone 19-11-2 in 32 games with a 2.57 GAA, a 91.2 save percentage and a pair of shutouts. Both goalies started to taste success after January 1st when the Hurricanes sat in 13th place in the Eastern Conference with a mark of 15-17-5. They’ve gone 30-12-2 since then with Mrazek starting 24 games and McElhinney getting the nod in the other 20. In addition, McElhinney who will also be an unrestricted free agent in July, was named as the Hurricanes’ nominee for the Bill Masterton Trophy for perseverance and dedication to hockey. Carolina also got a lot of production out of another veteran this year as forward Justin Williams was signed as a free agent in 2017 and named the team’s captain last September. The 37-year-old Williams is in his second stint with the club as he was a member of the 2005/06 Hurricanes’ squad which won the Stanley Cup. The 18-season veteran scored 23 goals and 30 points this year and hopes to add to his collection of three Stanley Cup rings this season. Williams also won a pair of Stanley Cups with the Los Angeles Kings and is regarded as one of the best clutch playoff performers of his generation. The right-winger, who has also played with the Flyers and Capitals during his career, has notched 36 goals and 94 points in 140 postseason outings and chipped in with seven game-winners. Carolina has received fine seasons from several players such as forwards Sebastian Aho (83 points) and Teuvo Teravainen (74 points) and Nino Niederreiter has chipped in with 29 points in 35 games since coming over from the Minnesota Wild in a trade for fellow forward Victor Rask earlier this season. Micheal Ferland and Jordan Staal have been effective and 19-year-old rookie Andrei Svechnikov has scored 20 goals and 37 points with all 20 goals being at even strength. On the blue line, Dougie Hamilton (38 points), Justin Faulk (34 points), Jacob Slavin (31 points) and Brett Pesce (29 points and +34) have added offense to the cause. But still, the biggest surprise has been the goaltending. Ironically, both Mrazek and McElhinney will be free agents on July 1st unless they ink new deals with the Hurricanes. 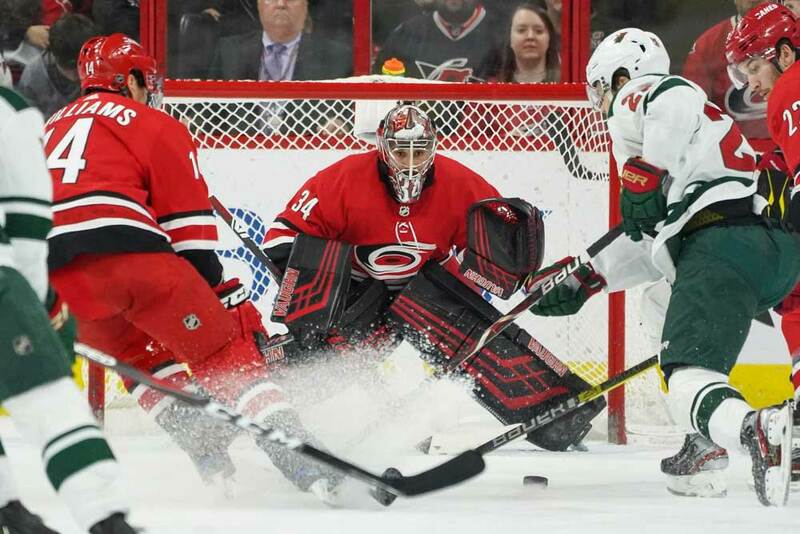 Their chances of re-signing or earning bigger paychecks elsewhere will definitely receive a boost if they can continue to backstop the Hurricanes deep into the playoffs.